For all you budding vampire slayers there is now a product on the market that will help you train for the unexpected. Never will you fear walking outside after dark once you have mastered a few moves with the Slam Man. 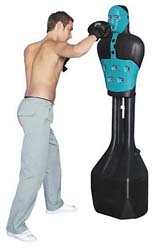 Ok... that might be stretching the truth a little, but if you have always wanted a punchbag to help you work out then forget it and look at getting your hands on one of these instead. Slam Man is a great way to have fun while keeping fit. As one of the eight lights switches on you must hit it as hard as you can (brings a whole new meaning to the phrase 'punching someone's lights out!') Or you can go for a combination of moves to help increase upper body strength. And, as you progress, you might like to try a little fancy footwork. This exercise machine has three levels and five different routines to keep you fit. Four routines are programmed in already and the other is a completely random program. Once this monster is weighed down with sand or water, even Tyson couldn't knock it over. It has a variable punch setting so it will react to any strength of punch. You can take all your aggression out on Slam Man and the best part is he doesn't hit back. Every family should have one. Slam Man comes with boxing gloves and instructional video and his height can be adjusted up to a total of six feet. The only downside is that you have to buy a whole heap of sand to weigh it down - and then you can punch it like crazy and it won't move! Right! I'm off on patrol tonight, so heaven help any rogue vampires that get in my way.